The brand educator with a sales focus for the family business, Alex Chantecaille is passionate about our planet. The threat of global warming, the importance of ocean preservation, and finding sustainable ingredients to make conscience cosmetics makes her a beauty trailblazer. Editor Trudi Brewer shares her story. Flawless skin, and a wholesome warmth, I felt like I had known Alex Chantecaille most of my life. Her politics and mine were aligned, and her concern for our planet and the endangered animals trying to survive on it is admirable. Alex Chantecaille wants to make a difference, and her role with the family company in sales and marketing not only focuses on the products the brand creates, Alex also helps to spread the brands' philosophy, her mother also started 20 years ago. “To be a voice for those who don’t have one, and align ourselves with people who care about the earth and the environment,” says Alex. That brand born after as career with Estèe Lauder, Sylvie Chantecaille the founder knew she wanted to create a clean beauty range. Free from nasties including phthalates, sulphates, detergents, mineral oil, petroleum, palm oil, artificial colour, and fragrances. And of course cruelty-free, which goes without saying when you learn more about their work with endangered animals. Here’s a lesson in the luxe-y French-inspired New York-based skin care and cosmetic brand Chantecaille. Three generations of Chantecaille women, founder Sylvie Chantecaille, daughters Alex and Olivia with Alex’s daughter, Delphina. I love it. We all get along really well and like spending time together. We're a close family, because my parents are French and had no extended family in New York when they moved to set up the brand they had a very tribal way of keeping us close and that has remained. We all work in the business, (my father, sister and brother) but we all have defined roles, and no one is above the other. As a brand, you consider the planet first, why was that your focus? 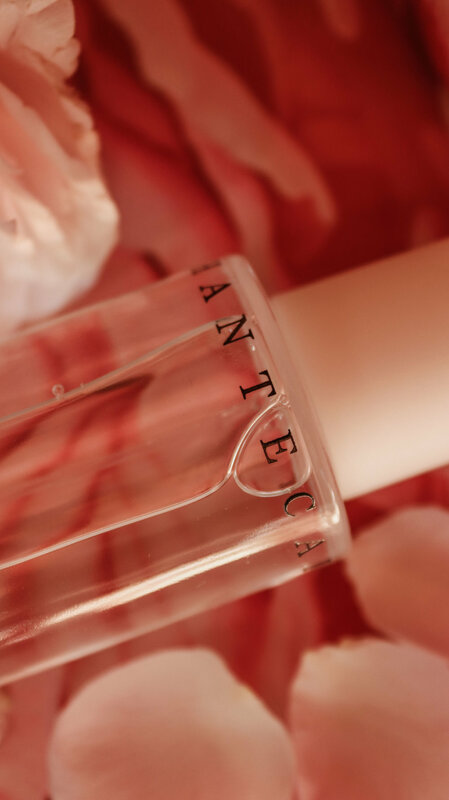 Being a clean beauty brand started out as a novel concept when my mum launched Chantecaille. She wanted to make it simple and use flower fats, or flower waxes as the base to the skincare, which 20 years ago was a new concept. She wanted to address the concerns women had regarding extreme allergies and reactions to colour and fragrance in cosmetics. Also, leaving Estèe Lauder corporation she knew if she was going to start her own line she would take the good and not the bad from mainstream cosmetic companies. Utilising pure plant power, such as plant stem cells is something we use more and more in skincare, taking the intelligence from nature we also use the pink from a peony or the orange colour from a tiger lily flower to make our colour cosmetics as well. We strive to be as clean as we can be, that is very important to us as a company. Also, today, that notion is not a trend it's what women demand. Who is the Chantecaille woman? Someone who cares about the planet, someone who is very natural. Someone who is engaged and active in the world. Women who are enjoying life, from career women to women raising families. Our clients want simple, elegant and sophisticated products, that make their lives better. Alex Chantecaille with editor Trudi Brewer at MECCA on Queen Street in Auckland. Why is the Rose de Mai significantly used in the range? Mum and my sister stumbled across a field of hot pink Mai roses in May while visiting Grasse in France. They were looking for a jasmine farm at the time to make fragrances, they had to stop at the rose farm. They knocked on the door, and the farmer shared that he was harvesting the roses for Chanel for their No 5 fragrance. The farmer also shared that this Mai rose is not only great for scent making, it is also good for the skin. Distilled with artesian water, not alcohol, it's made into steam, which is then condensed back into liquid and the result is a healing vitamin C moisture, packed skin hydrator we now use as a skin mist. It's the core of the brand today, not only is it made using handcrafted, artisan process, which is something we love, it heals redness, the scent opens the heart Chakra, it centers you, it's soothing and calming. It's pure, expensive to make, but authentic. Alex Chantecaille at the North Pole, also with brother, photographer Philippe Chantecaille, at The Perfect World Foundation. Alex Chantecaille supporting Rainforest Alliance. Alex and Sylvia Chantecaille. Alex Chantecaille at Space for Giants, an international conservation organisation. Who do you support through your philanthropic endeavors? There are so many, each season we align our products with a cause that needs a platform. In the beginning, it was really serendipitous. We had an early relationship with a family friend in New York who suggested there was someone working with coral in the Indian ocean researching how to strengthen the coral and make it resistant to bleaching. So we went to a couple of their conferences and we shared the media coverage we had received from supporting the coral research and the butterfly preservation, and all of a sudden we developed a Rolodex of scientists to work with. Today we work with many organisations, including Space for Giants and the Sheldrick Wildlife Trust in Africa, who help baby orphaned elephants, reintroducing them back to the wild. And this spring we are focusing on Asian elephants, who are not as well known as the African prairie elephant but are also at risk. We also work closely with Marine Conservation Institute to support their efforts to protect 10 percent of the Ocean by the year 2020. With all of these initiatives, we donate five percent of the wholesale sales from our six Philanthropy Cheek Shades to each cause. And coming soon there will be six new eye shadows that will become a permanent line. Each eye shadow like the Cheek Shades will feature different animals embossed in the eye shadow powders. The proceeds from the sales again going toward our global causes. As animal lovers, we are committed to supporting as many initiatives that help endangered animals as we can. Tell us about your tree planting campaign in Kenya? This spring our focus is on global warming. Warming oceans and melting glaciers is an environmental crisis. Without ice, polar bears, arctic foxes, and many other species won’t survive. C02 emissions are rising without the ice’s reflective action to deflect heat. One tree can filter 36,500 gallons of water each year. An average-sized tree produces enough oxygen each year to keep a family of four breathing. So to support this, with each Lip Cristal sold, we’ll plant a tree in the Attenborough Canopy in Kenya, we are committed to the notion that young forests are the hope for our planet’s future. Chantecaille Pure Rosewater, $127. Chantecaille Just Skin, $127. Chantecaille Philanthropy Cheek Colour, $69. Chantecaille Vital Essence, $198. Chantecaille Anti-Pollution Finishing Essence. Full of hydrating hyaluronic acid (HA) base, you know you are born with lots of HA as a baby, and it reduces as we age. Not only does it help moisturise the skin it shields the skin from the visible effects of blue light pollution that we're constantly bombarded with from the technology that surrounds us. 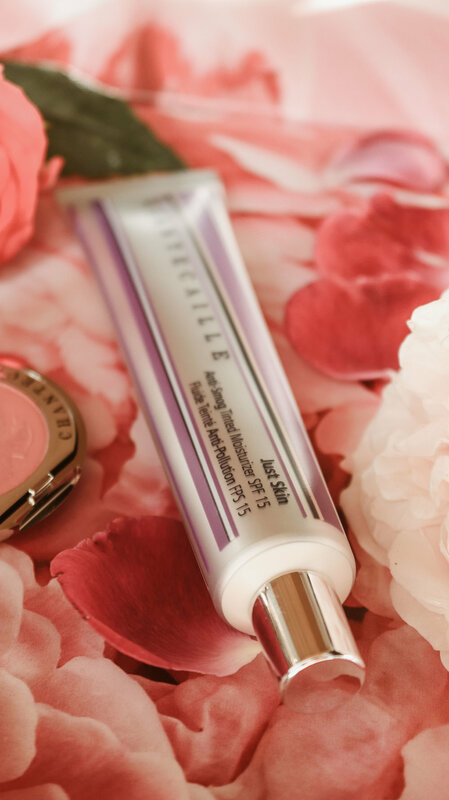 Chantecaille Just Skin, it's the most versatile tinted moisturiser that does offer good coverage, helping to give skin an even tone as well as that essential SPF protection. And what are your favourite? I think the serums, especially as I get older. Chantecaille Vital Essence it contains stable vitamin C, which gives skin instant hydration helps reduce redness, and it suits any skin type. And, if you don't have moisturiser this serum does it all.